And we have today’s leak for the OnePlus 6, the much-anticipated flagship smartphone of 2018. The complete specifications of the OnePlus 6 are now posted online, well if this rumour seems to be legit. The OnePlus 6 will ship with a 20MP selfie camera to the front, followed by a dual camera setup with f/1.7 aperture. Alongside this, the battery capacity, display size and Android version have been leaked as well. 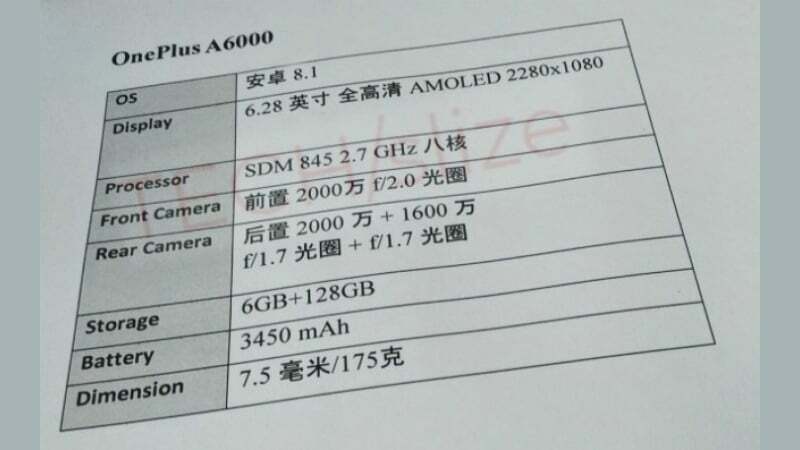 And most of these specs are in-line with the recently launched Oppo R15 specifications. As per the leaked image, the OnePlus 6 will flaunt a 6.28-inch Full HD+ AMOLED display, carrying a resolution of 2280 x 1080 pixels. Well, this is the same screen size of the Oppo R15 smartphone launched a while back. This is very much expected considering what we have seen in the past. Internally, the OnePlus 6 will sport much powerful hardware in the form of Snapdragon 845 SoC with a maximum clock speed of 2.7GHz. The chipset, as expected, will be paired with 6GB of RAM and 128GB of internal storage. It seems like OnePlus is planning for a 6GB+128GB storage model, whereas the previous models arrived with 6GB+64GB storage and 8GB+128GB storage. Having said that, there might be an 8GB RAM and 256GB storage option this time, and it could be priced at $749, as we reported earlier. The OnePlus 6 is expected to arrive with the same camera setup as the OnePlus 5T- a 16MP primary sensor with f/1.7 aperture and a 20MP secondary sensor with f/1.7 aperture. However, the front-facing camera will get an upgrade to 20MP from the 16MP unit seen on the last two iterations. The OnePlus 6 will arrive with Android 8.1 Oreo out of the box, which will be topped with the OxygenOS version on top. The phone is said to be fuelled with a 3450mAh battery, same as the Oppo R15. Also, the design of the OnePlus 6 is expected to be the same as the Oppo R15 with a glass back, 19:9 notch display, rear-mounted fingerprint scanner. The Oppo R15 also featured a glass back, however, it didn’t feature wireless charging. The OnePlus 6 is expected to arrive with wireless charging.